I believe the evil woman pictured in Revelation 17 symbolizes the city of Rome and its corrupt spiritual system. And I believe that system will initially be an amalgamation of the world's pagan religions, including apostate Protestants, under the leadership of the Roman Catholic Church. Why did the Pope feel it was necessary to bring together pagan religious leaders to pray to pagan gods? Does the Pope feel his own god is inadequate to the task? The most obvious answer is that the Pope believes all the leaders were praying to the same god. This is one of the most popular ideas in Christendom today. It is the concept that God has revealed Himself in many different ways to different peoples. The conclusion, therefore, is that there are many roads to God. It is tolerance gone to seed. It also contradicts the Scriptures which say that God has revealed Himself in only one person, His Son, Jesus of Nazareth (Hebrews 1:1-2). In December 2000, Pope John Paul muddied the waters further when he addressed 30,000 pilgrims in St. Peter's Square. He told the multitude "that all who live a just life will be saved even if they do not believe in Jesus Christ and the Roman Catholic Church. "3 The Pope added, "The gospel teaches us that those who live in accordance with the Beatitudes... will enter God's kingdom." He concluded by observing that all that is needed for salvation is "a sincere heart." In short, the Pope made a liar of Jesus Christ who proclaimed, "I am the way, and the truth, and the life; no one comes to the Father, but through Me" (John 14:6). Jesus is also recorded in John 17:3 as having said, "And this is eternal life, that they may know You, the only true God, and Jesus Christ whom You have sent." 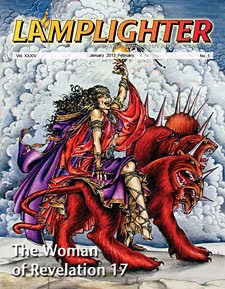 Notice that the harlot is portrayed as riding on the back of the Antichrist (Revelation 17:3). I believe this symbolism indicates that the church has become a nuisance. The Antichrist has used her to help consolidate his world kingdom, but now she has become enamored with power and is trying to dominate the Antichrist and his kingdom. So, the Antichrist turns on the church and destroys her (Revelation 17:16). At this point I believe the Antichrist will replace the Catholic Church with his new one-world religion that is headed up by the False Prophet. And, I believe this one-world religion will be Humanism carried to its ultimate conclusion — the worship of a man. Humanism is the belief in Man. It is the foundation of all pagan religions, including pagan Christianity. The False Prophet will call on all humanity to put its trust in the Antichrist as its Lord and Savior. And since the Antichrist will be possessed by Satan (Revelation 13:2), the whole world will in reality be worshiping Satan himself. Considering the fact that the Catholic Church is most likely to be the cornerstone of the Apostate Church of the first half of the Tribulation, what should be our attitude toward Catholicism? Was the Reformation simply much ado about nothing? Has modern day Catholicism reformed itself sufficiently to justify our overlooking doctrinal differences in the name of Christian love and unity? The first point I would like to make is that Catholicism is not nearly as apostate as some forms of mainline Protestant Christianity. The Catholic Church strongly affirms the virgin birth, the deity of Jesus, and the reality of the Resurrection. All three of these cornerstone truths have been rejected by mainstream liberal Protestantism in its obsessive search for what it calls "the historical Jesus." In short, apostasy is not a Protestant versus Catholic issue. There is apostasy on both sides of the fence. If Catholicism affirms the deity and resurrection of Jesus, then where does it fall short of Biblical standards? Where is the apostasy? In the second part of this series of observations on the Woman of Revelation 17, we'll look at the various doctrinal apostasies within the Catholic Church. 1) Sunday Advocate, Baton Rouge, LA, October 1, 1989, page 3A. 2) Time, November 10, 1986, pages 78-79. 3) Vatican City (RNS), "Pope Says Unbelievers Will Be Saved If They Live A Just Life," December 6, 2000. Babylon is a GREAT CITY. "And their dead bodies will lie in the street of the great city which spiritually is called Sodom and Egypt, where also OUR LORD WAS CRUCIFIED". Jereusalem here....no longer a whore(as was throughout the Scriptures). What better place to spew out fornication from?